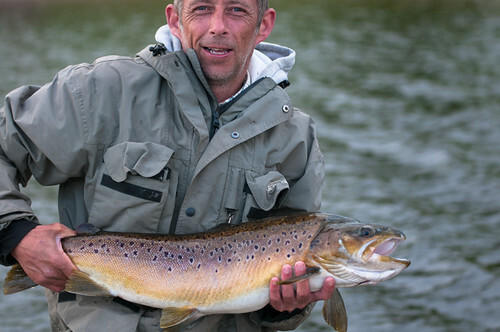 This entry was posted in Bank House Fishing Reports on September 29, 2012 by Ben Dobson. This morning there was a super sunrise here at Stocks, the sky was awash with pinks and various shades of orange, there was no breeze and trout could occasionally be seen rising, an impressive sight. Out on a boat today was season ticket holder Richard Newbolt. Although Richard caught and had several other chances he took his fish finder out and said there were several areas holding numbers of fish. Both gull and willow islands held good numbers but down Bens beach and at the back of willow island along the northern shallows were where the highest numbers were concentrated. This is worth knowing should you be out on a boat over the next few days. Ben is due to stock again tomorrow so there will be even more in there. See you on the water Paul. This entry was posted in Stocks Reservoir Fishing Reports on September 27, 2012 by Ben Dobson. BANK ROD AV: 2.3 fish per angler. BOAT ROD AV: 0.5 fish per angler. SPORT: Today was the Stocks Pairs Grand Final and eighteen pairs took to the water to try and become the 2012 champions and to win the £1000 first prize. The fishing from the boats was difficult and the competitors knew that every trout caught could prove to be crucial. In first place with five trout for 9lbs 10oz were father and son team Richard and John Hood. They caught all their fish along the willows behind Willow Island. All five trout and another that snapped the leader took the same fly, a sunburst humongous fished back on a Di3 or a Di 5 sinking line. Good Angling guys, John’s had a great week as he qualified for the 2013 England Team on Friday. In 2nd place with three fish and winning £500 were Jim Pickford and Ray Sanders who caught their fish on black tadpoles and cats whiskers. In 3rd place with 2 trout winning a £300 tackle voucher was Andy Cooper and Derek Moore and in fourth place also with two fish winning a £150 tackle voucher was Steve Bland and Duncan Watson. The best fish from the rest of the field was 2lbs 7oz and was caught by Usaf Dar and Jason Ruff, they won a sixth sense fly line apiece. Well done to all the competitors for reaching the final. This entry was posted in Stocks Reservoir Fishing Reports on September 23, 2012 by Ben Dobson. BOAT ROD AV: 0.2 fish per angler. This entry was posted in Stocks Reservoir Fishing Reports on September 22, 2012 by Ben Dobson. This entry was posted in Stocks Reservoir Fishing Reports on September 21, 2012 by Ben Dobson.